It isn't easy being the rather overlooked and unhappy youngest sibling to sisters named for the other six days of the week. Sunday’s only comfort is writing stories, although what she writes has a terrible tendency to come true. The prince returns to his castle, intent on making Sunday fall in love with him as the man he is, not the frog he was. But Sunday is not so easy to woo. How can she feel such a strange, strong attraction for this prince she barely knows? And what twisted secrets lie hidden in his past - and hers? Sunday and her sisters are about as different as different can be. Each with their own personalities and destinies that await. Like other tales where there are more than enough siblings to go around, Enchanted suffers a bit from the 'match the name with what is happening to them' syndrome. Initially, I was under the impression that Enchanted would simply be a retelling of the classic fairy tale, The Frog Prince. But there is much, much more to Enchanted than that. So much so that I wish I had only gotten a retelling and not what actually occurs. 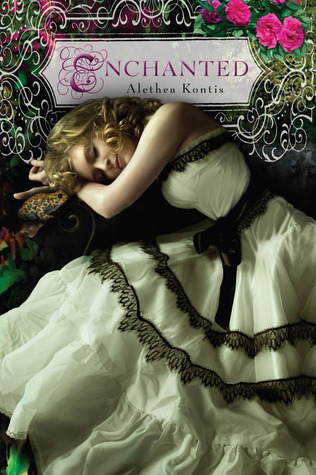 You see, Enchanted, unlike my expectation, is a retelling of quite a few fairy tales all rolled into one tale. Each sister has their own fairy tale adventure attached, causing the book to sadly feel more weighed down than it should have. And, in my opinion, taking away from the main reason I picked up Enchanted in the first place. That is not to say that the main story is absent. It's not… but it is a tad weak. Or that the tale is not interesting or delightful. It was… once, the plot actually got back on track. But the lack of focus and the tale going overboard to include other tales, takes away from the continuity of the book as a whole. The Frog Prince has always been a favorite of mine, and one retelling that does not come along often. For me, Enchanted was a decent read. But with all the extra baggage, I was lost in trying to figure out how all these extra pieces fit into the big picture. Enchanted, for me, would have worked much better with the less is more approach. But as is, works on quite a few levels as well. It is sadly difficult to recommend this tale unless you are seriously in need of a fairy tale retelling or just enjoy fairy tales as a whole. While I do enjoy a good fairy tale retelling, this one does sound a bit too heavy. Ah, sorry you didn’t really enjoy Enchanted as much. I might pass up on this one – not sure about Enchanted after reading quite a few disappointed reviews from other bloggers. Thanks for the review! I definitely agree with you on this one. I found the story to be crowded, and at times even a bit confusing (especially with the faeries). It seemed almost like more than one story was going on. I can only think of one other retelling of The Frog Prince, which has never been a favorite story of mine since I hate the spoiled princess breaking her word but I felt like Sunday was much more sympathetic in this story. I also agree that there was a little too much packed into the book but it was sweet and enjoyable nonetheless. Hmmm.., I tend to like when a story sticks with one retling thread. The cover is stunning though…got my attention.